The word “revolutionary” is not to be used lightly and should be used to place significant emphasis on a product that is simply said to be shaking up and changing the decking game as we know it. Trex Transcend decking is doing exactly that and there are undeniably good reasons why. Why Is Trex The Decking Industry Leader? Trex offers one of the most innovative alternatives to timber decking in the industry. They have been around since 1996 and have continued to innovate and improve their line-up of decking products. Where they have revolutionised the game, is by creating a timber alternative to decking that requires low maintenance, is highly durable for any outside environment and most importantly is made from eco-friendly materials contributing to a more sustainable earth, now that’s awesome. Trex success story and pure market dominance rests on their composite decking formula. The eco-friendly composite decks are made from an innovative blend of 95% recycled materials consisting of recycled timber, saw dust and plastic film. Not to mention the unparalleled beauty of their Trex Transcend decks, boasting a deep timber grain pattern which still gives your decking that aesthetically beautiful timber texture with an array of luxury colour pallets to choose from. One of the major differences vs normal timber decking is the hassle-free benefits this product possesses. Trex Transcend decking requires no sanding, no painting and only requires a simple soap and water cleanup, which is perfect for hassle free maintenance, so you can simply just enjoy being in the outdoors on your new deck. Another benefit is you don’t need to worry about your deck fading, forming mold spores or collecting scratches from your beloved pet or the general wear and tear teething issues. This is perfect for Australian home owners residing in Melbourne with the high chance of experiencing 4 seasons in one day or the harsh hot & dry months which could lead to your current deck fading away and losing its glorious glare. Is Normal Timber Decking or Trex Transcend Decking More Expensive? When it comes to Trex decking vs timber decking, there is more to consider than the upfront cost. At a glance you would see that timber decking such as Modwood, & Merbau is cheaper than Trex Transcend decking when comparing let’s say 40m2 give & take. What you need to consider is the lifetime costs involved in your choice of decking options. When comparing the costs involved and the maintenance required for the timber options, could actually cost you more $$ over time and most importantly your valuable time too when compared to the ultra-sleek & innovative Trex Transcend decking available. 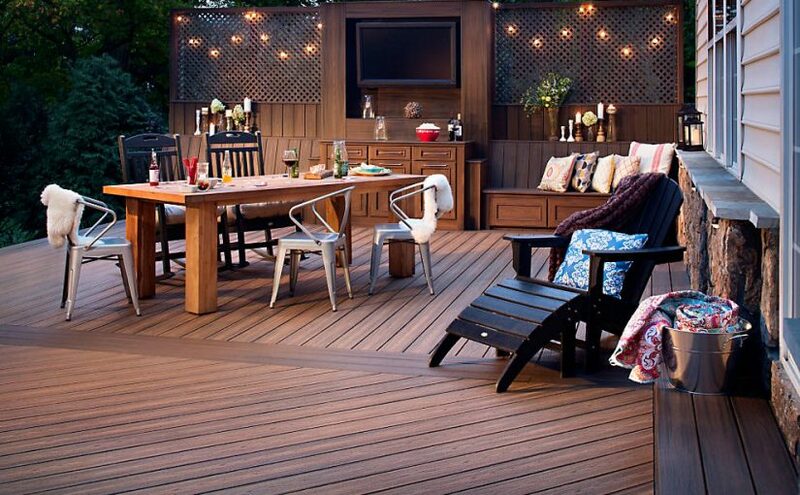 Which Decking Option Is Right for You? Demak Outdoor Timber & Hardware are a proud distributor of the revolutionary Trex Transcend decking in Melbourne, which is a first of its kind in Australia. You can visit us in Ferntree Gully or Heathmont (Ringwood East) and speak to one of our helpful experts behind the counter and find out which decking option would be the perfect match for your outdoor deck or alternatively order online with delivery anywhere in Victoria.